Hundreds of Danes have been convicted of human smuggling for giving rides to migrants. The Danish government is charging hundreds of its citizens with human smuggling for giving rides to refugees, the Washington Post reports. Denmark has been aggressively combating the wave of migrants from Germany. 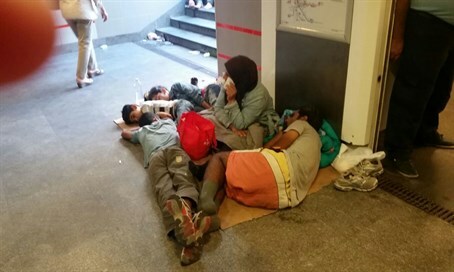 The government strongly reduced the benefits it provides, migrants are banned from public transportation, and authorities often confiscate their possessions. Denmark even placed ads in Lebanese newspapers, warning people against coming to the Scandinavian country. At the same time, Danish citizens who take migrants to the Swedish border are arrested for human trafficking. While the government is primarily based around the center-right, the strongly anti-immigrant Danish People's Party has pushed it to take a firm stance against both migrants and the Danes who help them. "These people broke the law. Human smuggling is not all right — not if it’s done by the train company and not if it’s done by private individuals," said MP Peter Kofod Poulsen. Poulsen has argued that Denmark should accept "as close to zero [refugees] as possible." Otherwise, he warns that the influx will bring the Middle East's problems to Europe. Others, though, argue that the callous attitudes towards the victims of civil war and terrorism violate the fundamental principles upon which modern Europe stands. "We’re losing respect for the values upon which we built our country and our European Union," says Andreas Kamm, the secretary-general of the Danish Refugee Council. "It’s becoming very hard to defend human rights."